Cheapeats, Inc. Blog » Where To Meet For Drinks? Now that’s the weather is nice and people are getting outdoors, the classic after work activity is…….LETS MEET FOR DRINKS. After a while, the usual spots seems boring and the drinks seem dull. Not anymore. Pranna is a Modern Restaurant that has a Southeast Asian influence. It’s one of our favorite places in Nomad, because they’re always changing with the seasons. If you don’t know Pranna, they’re the restaurant where Steve Jobs had his secret meetings and ordered a drink that wasn’t on their menu….Mango Lasse. I digress. Cheapeats was recently invited to an event, to sample their new Signature Summer Cocktails and Nibbles. A FREE COCKTAIL? Count us in. 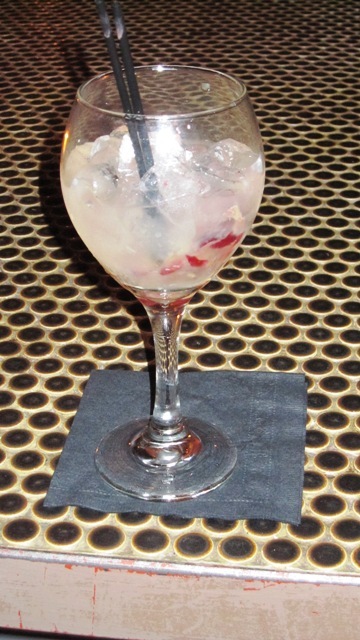 A Pranna Sutra consists of muddled red seedless grapes, fresh lemon juice, white wine and Kettle One vodka. Refreshing, cool and SOOOOO tasty. A perfect summer cocktail. Many of the other bloggers were sampling all the drinks. But when you have the best, leave the rest. Hey, we’re hungry…Where’s the food? 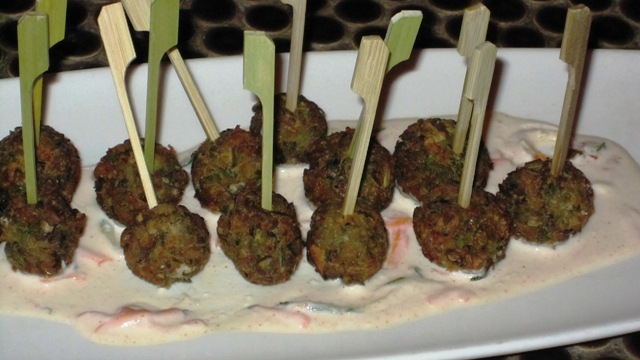 This was a twist on your typical Falafel, which is usually made with chick peas or fava beans and cous cous. Who cares? We love them all. Crunchy on the outside and moist on the inside and with a Tahini dipping sauce. Not my personal favorite. There was a bit too much cumin and felt it overpowered it. Sorry. Samosas are very similar to Empanadas. They’re dough pockets filled with either vegetables or meat. You often find them in street markets, because you can eat them on the run. These were filled with Chicken and Peas. The dough was billowy, not tough and the surprise filling was creamy. Again, just a little too much curry for me, but otherwise delicious. This dish was the star of the evening. Everyone LOVED this dish. 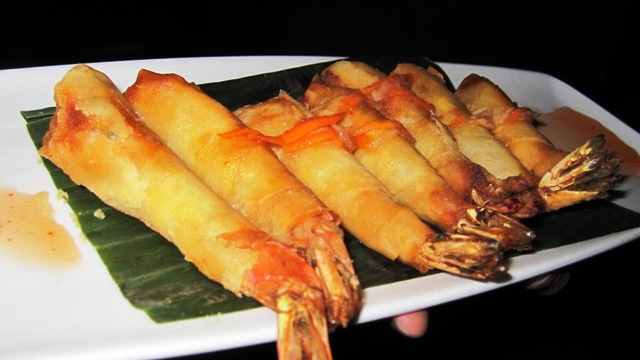 Giant Tiger Shrimp wrapped in Filo Dough drizzled with a sweet chili sauce. It was the perfect combination of crunch, sweet and a little heat. 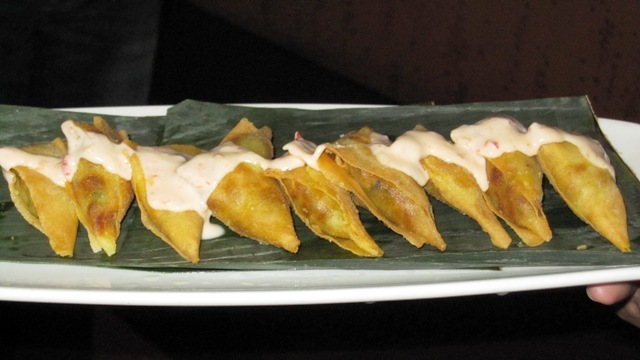 Very similar to a Spring Roll, but SOOO much better. 2 THUMBS UP!!! 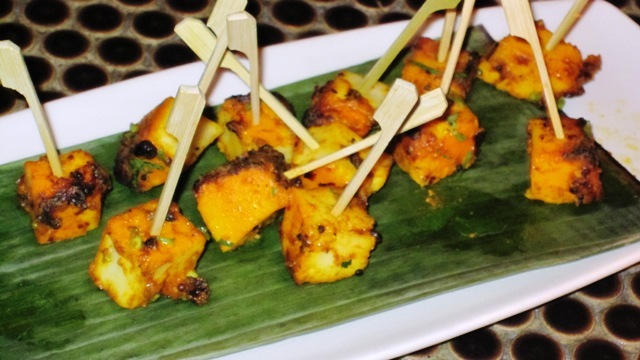 Paneer is India’s version of Cottage Cheese. You’ll find this in many Indian Dishes. A fave of mine. What the Chef did here, was marinate it in yogurt, ginger, garlic and assorted spices and I think baked it. Perhaps fried? A CROWD FAVORITE. Who doesn’t love a Kabab? If you do, you will LOVE these. 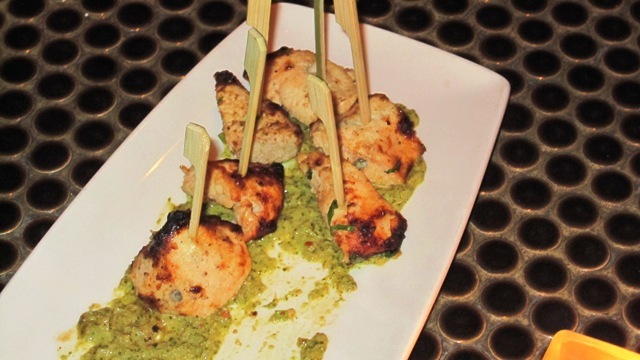 Chicken cubes, that were marinated in yogurt and spices, and set over a mint chutney sauce. The chicken was SO moist and juicy, but combined with the sauce….PERFECTION. Another crowd favorite. 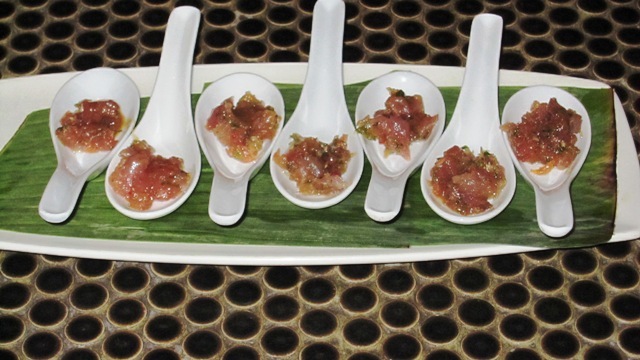 I LOVE Tuna Tartare and this did not disappoint. Elegantly presented in soup spoons, this dish combined sweet and heat. Ahi Tuna with Shisho Leaf, scallions and soy sauce. It was SO refreshing. LOVED, LOVED, LOVED this dish. Need a date spot? Meet for drink spot? Or just need a drink? Head over to Pranna. You won’t be disappointed. Thank you Payal Sharma, Katie, the entire team at Pranna and The Blaq Group for an enjoyable evening. CHEERS! This entry was posted by Rosemarie on Monday, July 9th, 2012 at 6:53 pm	and is filed under Asian, Bar/Pub, Flatiron District, Indian, Manhattan, Mediterranean, Murray Hill. You can follow any responses to this entry through the RSS 2.0 feed. You can leave a response, or trackback from your own site.